Buck Wild was one of the characters of the Milestone comic book publisher. If you’re not familiar with this universe, we suggest that you first read our character profile for Icon, as Buck Wild primarily appeared in his book. 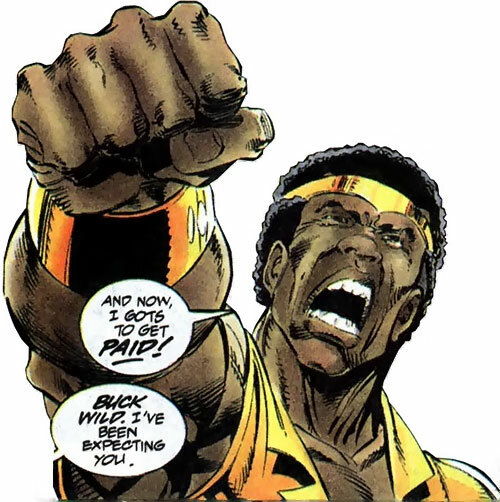 Buck was an over-the-top parody of many past Black super-heroes. 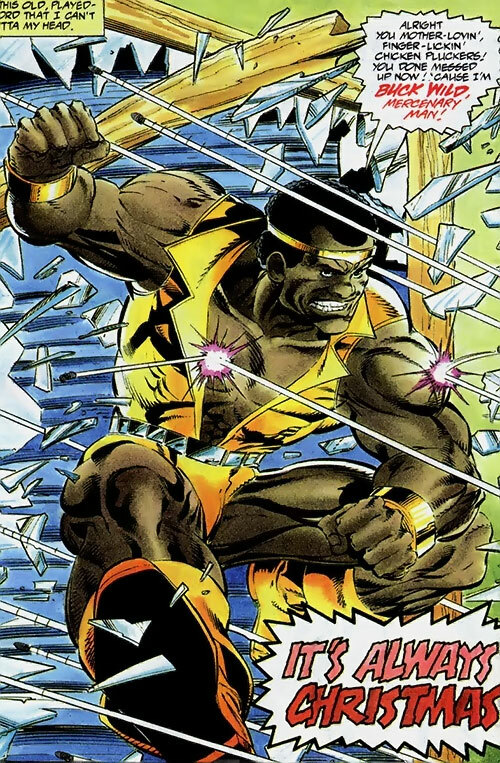 The Buck Goliath, Jim Crow, Buck Lightning, and Buck Wild identities were based on Marvel Comics’s Black Goliath and the Falcon, DC’s Black Lightning, and Marvel’s Luke Cage, respectively. 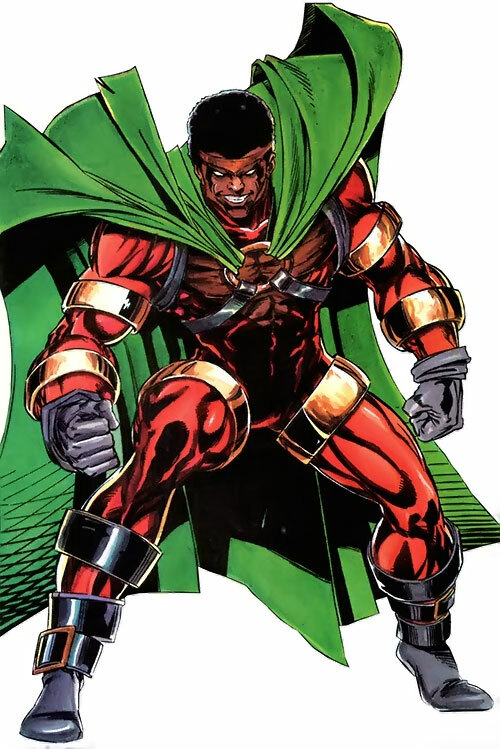 Buck Voodoo was a parody of Marvel’s Brother Voodoo, while the Kingfish was a satirical take on Black Lightning’s mob nemesis Tobias Whale, who was in many ways DC’s version of Marvel’s Kingpin. Buck Wild possesses superhuman strength enabling him to lift (press) at least 3 tons under optimal conditions. As a result of the experimental process he participated in, Buck Wild possesses superhuman strength and “tungsten hard” skin. His skin is durable enough to resist high caliber gunfire at close range, and is capable of absorbing the force of the impact of objects weighing as much as 1 ton with no visible signs of injury. Outside of his raw physical power, Buck Wild is an accomplished street fighter with decades of experience. Unfortunately for Buck, he encountered a particularly racist guard while in prison. As it turned out, Buck had dated his sister for a while, and the guard had taken exception to it. After receiving a particularly nasty beating from the guard, Buck realized that he most likely would not survive his prison sentence, much less make parole. In order to escape the guard’s attentions, Buck volunteered to take part in a cutting edge experiment which would put its subjects into a state of cryogenic sleep. In exchange for his participation, he would have a few years removed from his sentence. Ever eclectic, Buck found himself unable to settle on a single alias or even look for his superheroic identity. He swapped identities from time to time, coming up with new aliases including: Buck Goliath, Jim Crow, and Buck Lightning, but in the end he always returned to his original (and favourite) identity. No matter what name he fought under, Buck battled crime and corruption for a fee. He smashed drug rings, and battled gangs. He quickly built a reputation as a hero amongst the impoverished African Americans that lived in the low-income areas he frequented. Despite the fact that he was a mercenary, the inhabitants quickly realized that Buck had their best intentions at heart, especially when they realized that he had been lowering his prices and accepting payments in instalments in order to help every and anyone who needed it. Buck eventually crossed paths with Dakota City’s premier superhero, Icon, when he fell under the influence of Lysistrata Jones, a local drug lord. Lysistrata had the power to enslave men’s minds, and to be honest, Buck’s mind was an easy target. Icon’s partner Rocket had taken it upon herself to break-up one of the few remaining crack-houses left on Paris Island in order to release some of her frustration (she had recently discovered that she was pregnant). The crack-house belonged to Lysistrata. When Icon arrived (to calm Rocket down), Lysistrata sent Buck to drive them away. Buck Wild battled Icon with all of his “belief defyin’” strength, but ultimately proved to be no match for the might of the Hero of Dakota. Icon ultimately freed Buck from Lysistrata’s influence and the two men decided to bring her to justice. Almost comically, when the two men confronted her they were both immediately overwhelmed by Lysistrata’s influence. It was only the timely appearance of Rocket and a single well placed punch that freed them both from her power once more. Several months later, Buck found himself approached by two teenaged girls who were looking for a replacement for Icon. The older of the two, Raquel revealed that due to her own pregnancy and Icon’s return to his own people, that the city of Dakota needed replacement heroes. Out of all of the people that she had approached, Buck was the best to play the part of Icon. Buck was honoured at being chosen, and was still inspired by his previous meeting with Icon, graciously accepted. He went to work immediately, studying black literature intensely in the attempts to improve his knowledge of his people and to improve his vocabulary. After a few short weeks (and a slight alteration of Icon’s original costume), Buck assumed the costumed identity of Icon and continued to fight the good fight against anyone who would threaten the peace within Dakota City. Buck’s good fortune came to an end when the homicidal alien Oblivion arrived in Dakota seeking vengeance on Icon. Oblivion had murdered dozens of innocents by the time Buck had arrived on the scene. Fearless to the point of overconfidence, Buck engaged the psychotic alien in a one on one battle. Despite the vast difference in their strengths, Buck continued to fight until he moment when Oblivion ultimately delivered a mortal wound through his chest. Though Oblivion was defeated by the original Icon, Buck eventually succumbed to his wounds while convalescing in a hospital. He was temporarily resurrected as Buck Voodoo by one of his oldest foes, the Kingfish, who was enraged that Buck died at another’s hands. Upon his resurrection, Buck initially attempted to kill the Kingfish, but ended up surrendering to death once more after Darnice (Rocket II) convinced him that his time had passed. Buck Wild was a tall African American male. He had a broad and wide chest, and had layers of thick muscle that ran across the entirety of his body. His features were fairly typical of those found in African American males and his skin was a dark brown. He styled his hair into a thick afro and held it in shape using a golden headband. His original persona’s costume was a simple one. It consisted of golden bikini briefs, an open sleeveless shirt, boots, and head- and wristbands. As Icon II, Buck wore a modified version of Icon’s original costume. His version still consisted of a skin-tight red body suit that covers him from head to toe, except for a large triangular hole that sat directly within the centre of his chest. The significance of this gap is still unknown at this time. 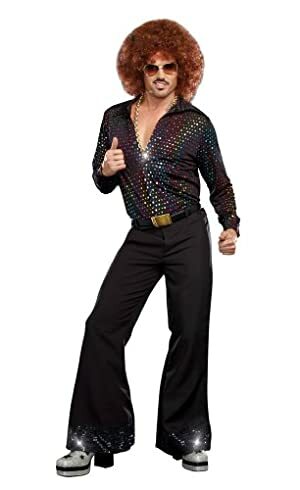 The rest of the costume was identical to the original. 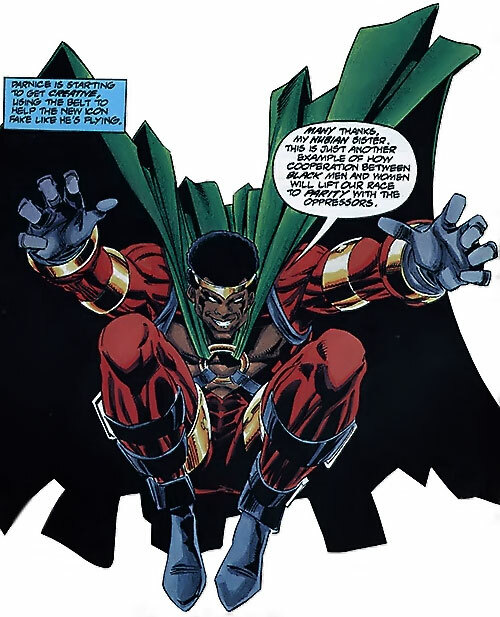 It was accessorized with golden thigh and armbands, a golden ring that sits prominently in the centre of his massive chest, grey gloves and boots, a black domino mask that made his eyes appear to be pupil-less and a disproportionately long green cape. Buck Wild was a simple, gregarious man. He embraced life to the fullest and did his best to help the less fortunate that surrounded him. He worked hard and did the best with what little he had. When empowered by the experiment he still chose to go “straight” rather than succumb to the negative emotions that surrounded him. Even though Buck spent most of his life as a “Mercenary Man!”, he genuinely cared about the community that surrounded him. He would often help those who needed it for free (or at the very least at a steeply reduced price). After he encountered Icon and Rocket, Buck improved himself through sheer force of will. Over time he completely altered his manner of speech, shed his 1970’s blaxploitation façade, educated himself and became a genuine true to life hero. 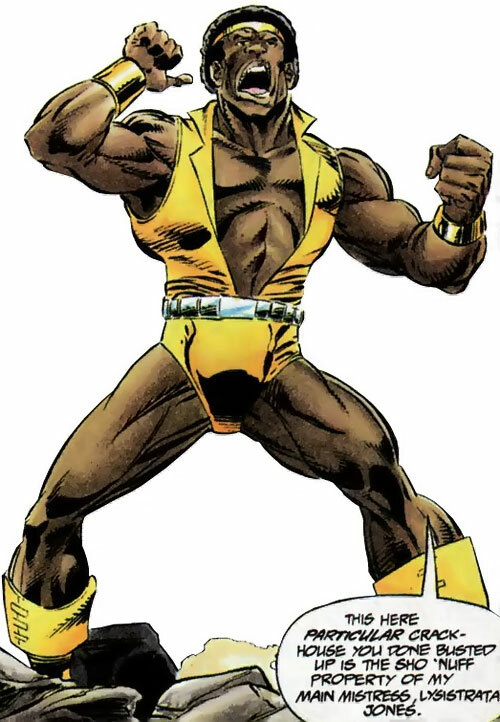 If Luke Cage (a.k.a. 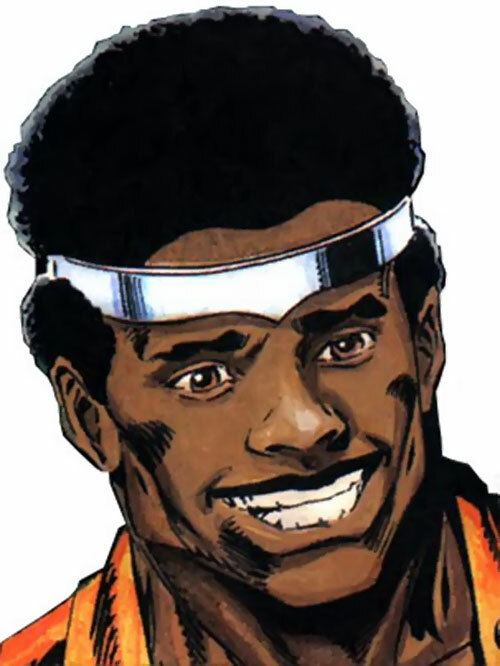 Power Man) also exists in your campaign they may have been subjected to the same treatment (since Buck Wild is an obvious Power Man clone). With both characters in the same universe, one of them should be played with a different personality to avoid redundancy. One possibility is that Buck Wild could actually accept a job with the local police department. 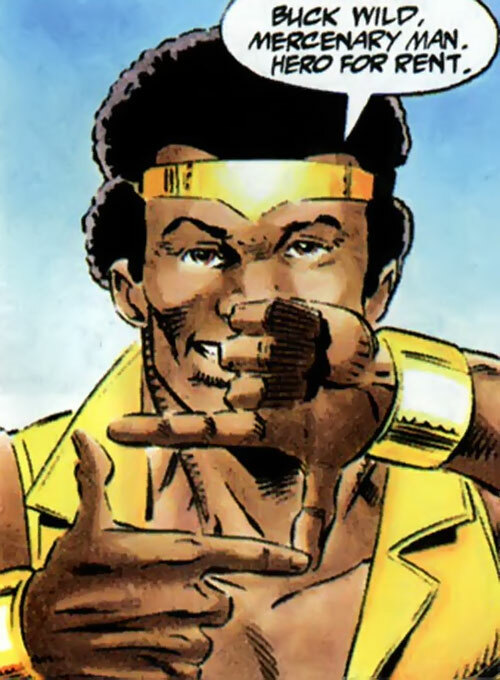 This might bring him into conflict with Luke Cage, particularly if Wild falls into the unfortunate habit of some American minority police officers to be unusually harsh on members of their own ethnic group. If Wild was employed in such a manner, he would have to have established his innocence or received some form of special dispensation, since a felony record would normally prohibit one from becoming a police officer. Density Increase is Always On, and already factored into his stats. Jumping is Contingent on STR. Rocket I (Low), Rocket II (High). CIA to Speaking Superfluously, Miscellaneous (Criminal Record), Oblivious, Public Identity, SIA to Not Hitting Women. ICON COSTUME [BODY 04, Gliding: 02]. 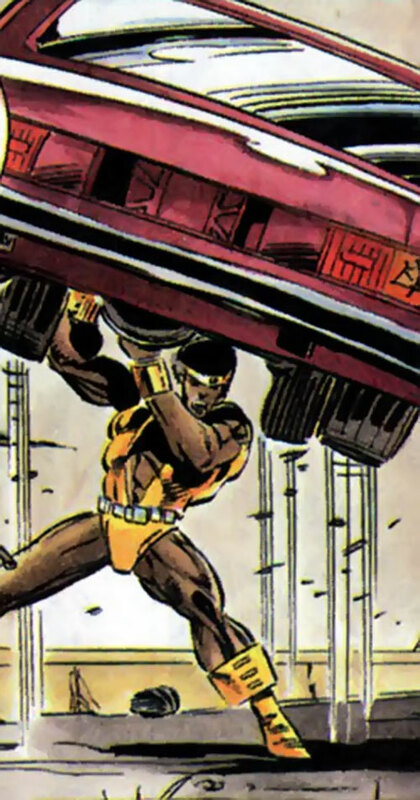 Dropped Buck’s STR by an AP since he’s never really displayed strength greater than the character he is clearly an homage to; “Luke Cage: Powerman”. 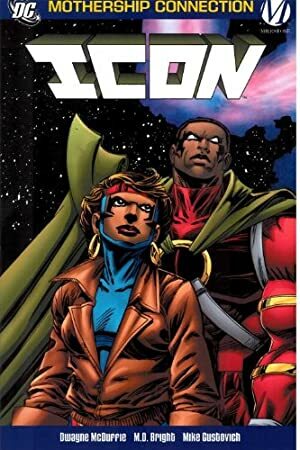 Source of Character: DC Comics Milestone Imprint Series – Icon, created by Dwayne McDuffie (Writer) & MD Bright (Artist). Helper(s): Kynn Bartlett (v1.2), JD Marquart, Roy Cowan. Helpers for the previous version – Brian & University of Scranton, Roy Cowan, The Milestone Rave and Dwayne McDuffie’s website . Writeup completed on the 11th of January, 2013.